LOS ANGELES, CA--(Marketwired - Jun 6, 2013) - IronX has arrived just in time for summer and takes high-definition video recording to new heights and depths -- literally. The new action camcorder gives the outdoorsy and active set a rugged, waterproof and wearable HD camcorder for any activity while streaming live video to mobile devices. Capturing what smartphones cannot, the IronX records full HD video and comes with a waterproof wrist remote and case, four different mounts for hands-free recording, and the ability to control the camera from the free IronX app for iOS and Android devices. The IronX is available today for $249.99 at www.ironxcam.com. The IronX action cam is designed for vacationers, athletes and thrill-seekers looking for a modern way to record and share footage in places and with features not possible from smartphone cameras today. 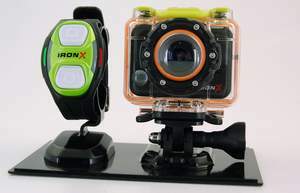 Wearable gadgets are on the rise and IronX's multiple mounts, waterproof casing and wrist remote capture photos and video while surfing, sailing, snorkeling, diving, windsurfing, skateboarding, bike/BMX riding, zip lining, skydiving and more. Wear: Mount IronX to nearly any surface such as helmets, equipment, even bodies for hands-free, point of view recording. The IronX comes with a 2.4G RF wrist remote control so users can take still and time-lapse photos and record and halt video footage without ever having to readjust their camera. Stream: With the IronX mobile app, users can live stream still photos and video to Android or iOS devices. Relax on the beach while taking part in a friend's live surfing or diving adventure. Edit: The IronX mobile app lets users easily edit on the fly before sharing, while the free ArcSoft imaging software offers more powerful editing features on PCs, with the ability to burn video to DVD or Blu-ray. Share: Unleash your video immediately by sharing to Facebook, Twitter, YouTube and Dropbox from the mobile app as soon as the action begins. IronX gives sports enthusiasts and the outdoorsy an affordable and wearable action camera that is easily adapted to any situation, surface and sport. The IronX possesses a unique range of features for any athlete or thrill-seeker, with high-definition video recording, live streaming to mobile devices, instant sharing to social channels, waterproof case and housing backdoor, long lasting Li-ion battery, HDMI cable for HDTV viewing, 170-degree wide-angle lens, 2GB of built-in flash memory and four included mounts, with more than 12 mounts and a variety of cases and accessory options. The IronX supports Mac OSX 10.5 and higher, and Microsoft Windows XP SP2, Vista and Windows 7 or higher. See the device in action on the IronX YouTube channel, and visit www.ironxcam.com for more information or to purchase.